Last week I reached out to all my readers requesting volunteers to guest post on MFG. To my surprise, I got several responses. 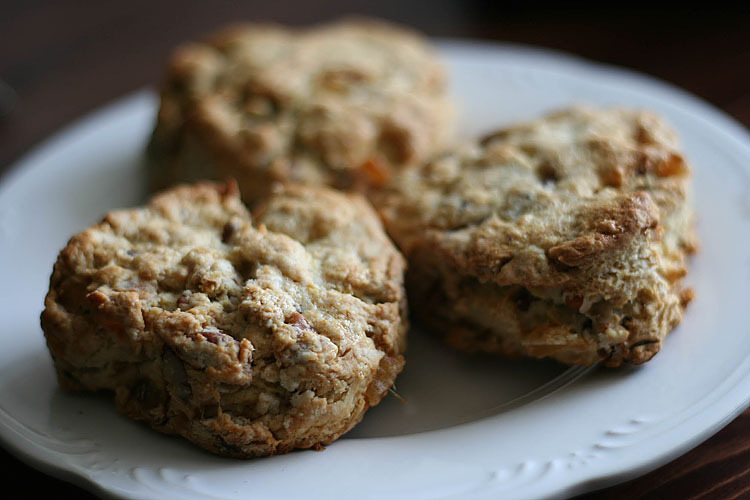 While she was not the first to respond, Jane was the first to send me a post about these wonderful Ginger Pecan Scones. I just reading your posting requesting for help–I’d love to contriute articles to your site. I have a food blog that I’ve just started to be more active in: http://butteredup.blogspot.com and I’d love to be more involved in the food blog community. I love desserts in particular, but I also love cooking too. Most of my first year of university was spent being homesick. My parents were halfway across the world in Shanghai, while I was in Montreal, missing the comfort of home. On weekends, I went to my cousin Sandra’s apartment, desperate for some company. Without realizing it, she helped distract my troubled heart and jerk start the glutton in me. We studied cookbooks (Donna Hay’s Instant Cook was our favourite) trying to decide on our weekend project. We sampled buttery croissants at Premiere Moisson on Mont-Royal. We trekked through a snow storm just to pick up a 10lb Rockaberry apple pie. I remember losing all sensation in my fingers and toes carrying that damn dessert and then eating two servings even though I’m not fond of pie, but just to make the walk seem worth it. Clearly, we shared a love for food. There was one thing that Sandra made that was insanely addictive. They were dried cranberry lemon scones. Buttery lumps of dough studded with ruby fruit, speckled with yellow zest. I really couldn’t resist eating only one and I found lots of good reasons to eat a few for breakfast, lunch, and dinner. No, I wasn’t eating my feelings of homesickness, though they definitely made the brutal winters more bearable. There was something magical about those scones, how they fall apart in your mouth, in a way that only cream and butter is able to do, and the dried fruit was chewy, inevitably wedging between your teeth. A few years ago, Sandra moved to Shanghai. We haven’t talked since she moved (she’s difficult to keep in touch with) and I haven’t had those cranberry lemon scones since. I have however, tried other scones. There were cheddar and chive scones to pair with a juicy salad, but they were unremarkable. I’ve sampled Hungarian paprika scones, which is an entirely different animal; yeasty pull-apart breads that stain your fingers a beautiful rust color and pair perfectly with stew. And there were these ginger and pecan scones. Hoo boy, they are good. So good, I want to rename them Dreamy Scones. They’re light and fluffy, and so crumbly, it will be hard to keep your table crumb-free. Three types of ginger are used here, ground, crystallized and fresh, but don’t shy away from ginger, the butter casts a spell on its heatness, toning it down. 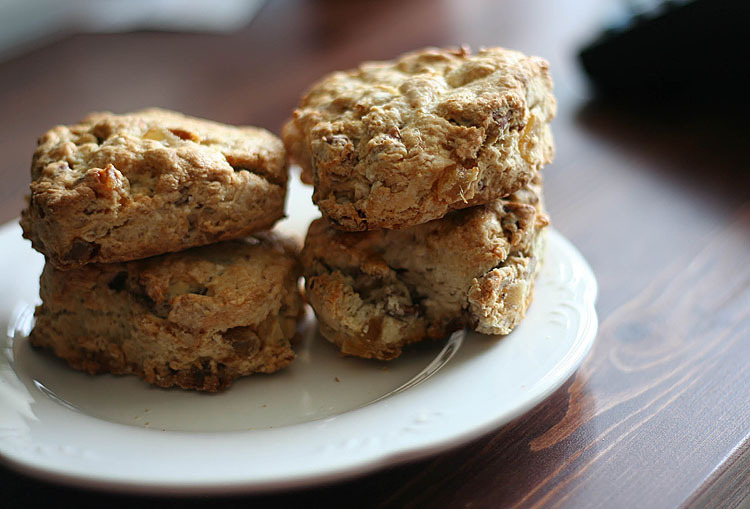 The pecans add a nutty crunch to the scones, making it hearty and breakfast worthy. I promise that just one scone will make your troubles go away. I don’t buy buttermilk. I don’t want to purchase one ingredient if I’m not going to use it anytime soon. Instead, you can make buttermilk at home. Really, it’s a breeze. For 1 cup of buttermilk, add 1 tablespoon of white vinegar (even rice vinegar works) to 1 cup of milk (I use 2% and it’s fine), allow to sit for 5 minutes before using. 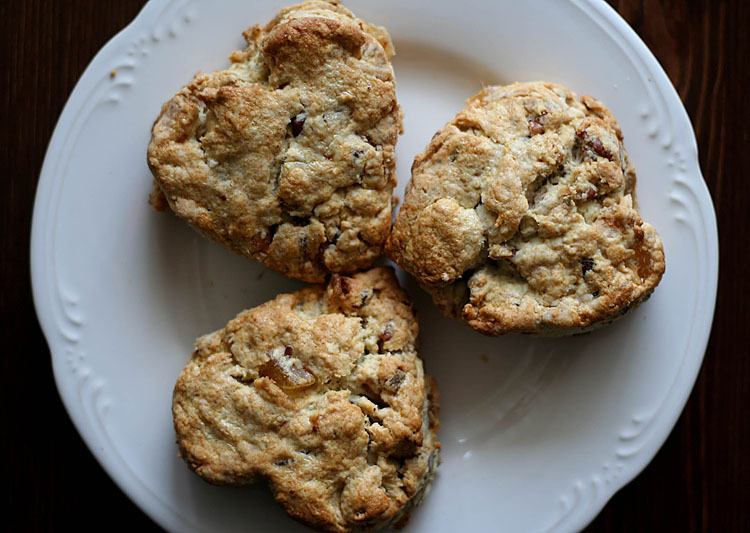 I only have heart shaped cookie cutters which I used to shape my scones, but you can use any round cutter you like, just make sure it’s about 2 inches in diameter. Preheat oven to 425°. Line large baking sheet with parchment. Whisk flour, 2/3 cup sugar, baking powder, ground ginger, 3/4 teaspoon salt, and baking soda in large bowl. Add butter; using fingertips, blend butter into flour until coarse meal forms. Toss in pecans and 1/2 cup crystallized ginger. Whisk 1 cup buttermilk, grated ginger, and vanilla in measuring cup. Form well in center of dry ingredients. Add buttermilk; stir with fork until moist clumps form. Transfer to lightly floured surface. Knead just until dough comes together; roll out dough into a 12-inch round (about 1/2 inch thick). Using a round cutter cut out scones and arrange about 1/2 inch apart on baking sheet. Gather and gently reroll scraps. Cut out more scones and arrange on baking sheet. Bake scones until golden and toothpick inserted horizontally into center comes out clean, about 20 minutes. Cool scones on wire rack. I love Jane’s recounting of her experiences and how they are attached to the sensory experience of food. Food is, after all a sensory experience able to capture and conjure a host of images that make us feel as if we’re reliving a moment in time. For that reason, the act of preparing food is the deliberate attempt to relive the past while simultaneously creating an entirely new memory through nostalgia.